This is one version among many Karnataka Spice powder used in most of the Veg sambars, sambar for Idly & lentils sambar or soup/rasam, this spice powder recipe is passed on from generations. Sun dry all the ingredients separately. Dry roast all the ingredients one by one separately. Note: Don’t over roast the ingredients. Let it cool & grind it to fine powder or you can also get it done from a flour-mill. Spread the powder on a news paper to cool it & to avoid it from getting dark brown colour. Put one layer press it tight do this for each layer so it gets compressed, it retains the freshness & lasts long. 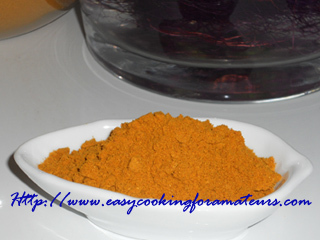 Flavourful sambar podi, truly handy.. I like the sound of home made sambar powder.. usually the ones i buy from store does not taste good!!! Thanks for sharing the recipe!!! I love Sambhar especially when fresh sambhar powder is added. This podi sounds great and perfect! Thanks for the recipe dear.. Thanks for sharing this recipe. The sambar powder is one of my favorite spices and I’m so happy I can make my own now. Thank you. i always buy the ready store ones.. this is quite helpful.. Thanks!